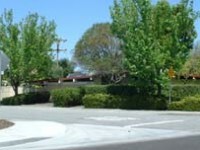 In 2005 I created a small website called “Surreal Suburbs of the Bay Area.” I’d been inspired by a book I’d read by Paul Lisicky called Famous Builder in which he describes a curious, unfinished subdivision he had visited as a kid. It made me think about the intriguing subdivisions and neighborhoods I’d visited – not necessarily unfinished, but unusual and oddly appealing for representing a distinctive approach to urbanism. When I first published the pages, I got a mix of correspondence from people who lived in the various communities. Some enjoyed the site, but others thought I was making fun of the places and were angry with me. Maybe the term “surreal” gave the wrong impression. But in any case, I’ll go on record as saying I like all the places I’ve chosen to profile; no hipster irony here. What is a Surreal Suburb? Maybe it’s one of those things that you simply know it when you see it. I wanted to create a site that looks at those quirky, idiosyncratic suburban places that somehow stick in your mind through their odd characteristics and uniqueness. They have an almost other-worldy quality thay makes them feel… surreal. A Surreal Suburb is not necessarily an entire city — in fact, it’s more likely to be a single large subdivision, rather than an entire suburb. These places stick out because they represent strong, individualistic visions on the part of their creators, and are significantly different from their more conventional suburban contexts. Some are experiements or dreams gone awry, representing a particular philisophical trend or interest. 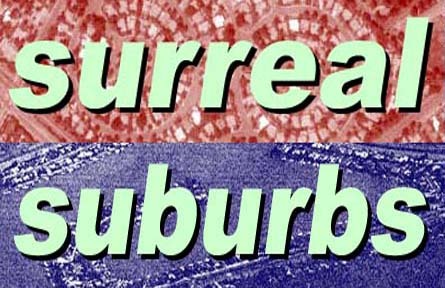 Most (but not all) of the Surreal Suburbs in this first round of surveys date from the 1950’s, ’60’s, and ’70’s. 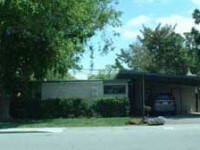 The period is a common reference point, representing a “new frontier” attitude towards suburban living. Some of these examples represent this attitude carried to an extreme. Being of that time period is not a prerequisite of being judged a Surreal Suburb, however, and over time suburban developments from earlier and more recent times will likely be added to this survey. Looking at an aerial photo or street map of Palo Alto, the eye is immediately drawn to a curious group of curvilinear streets in the south end of town. 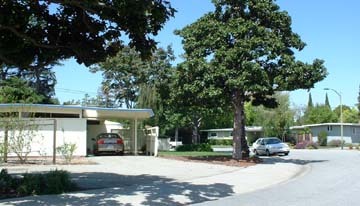 This is “Fairmeadows,” one of two Eichler Homes neighborhoods built in the 1950’s in Palo Alto, and one of many in the area. But this is the only one with the funky, memorable street layout. 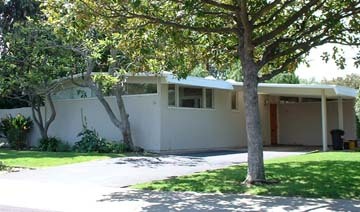 This in itself probably makes it one of be Eichler’s most photographed works. On the ground the street layout loses its impact somewhat. It’s not to say that it’s impreceivable, but more that it turns out not to be as big a deal as one might have expected. The streets do indeed go round and round in a sort of dizzying and disorienting way, but if one hadn’t seen the street map beforehand, it’s unclear whether the concept would be apprarent. This may be why the fad for cocentric street layouts, seen elsewhere in the 50’s in 60’s in places like Sun City, Arizona, was short-lived. But no matter — here, it gives an extra touch to what is already a distinctively surreal 1950’s high-design suburban development model. 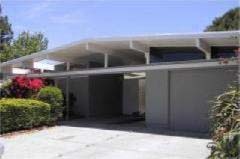 For those who aren’t familiar with Eichler Homes, “Eichlers” (as they’re known locally) are mod-style tract houses built in the 1950’s and 60’s by developer Joseph Eichler. Inspired by his tenancy in a rented Frank Lloyd Wright house in Hillsborough, Joseph Eichler set out on a mission of bringing high-design contemporary architecture to the masses. 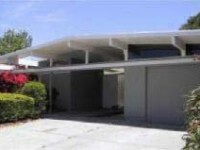 Eichler Homes, Inc. built nearly 11,000 single-family homes in California, as well as a few odd examples in other states. 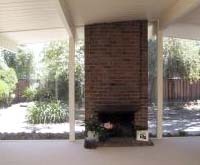 Beginning in 1949, when it was still uncommon to find merchant builders engaged with architects, Eichler became engrossed with building communities of homes characterized by both flair and affordability. Aligning himself with a stable of progressive, empathic architects – first the San Francisco firm of Anshen & Allen, then Jones & Emmons, later Claude Oakland – Eichler realized his dream, styled with imagination. As regional architecture designed for the Bay Area’s benign climate, their house designs befuddled the traditional masses – emphasizing boldness, change, and optimism through indoor-outdoor living, walls of glass, atriums, and radiant-heat floors. 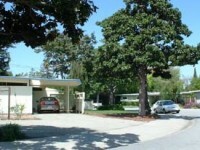 A strong proponent of fair housing and deeply opposed to racial discrimination, the liberal Eichler was the first large tract builder to sell to minorities, and even built a home on his own lot for an NAACP leader. Joe resigned from the National Association of Home Builders in 1958 in protest of racial discrimination policies and, according to reports from long-time Eichler owners, offered to buy back homes from those who had trouble accepting their neighbors. 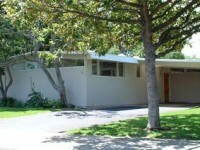 Eichler Homes now have a cult following. Some cities such as Palo Alto even have special design guidelines for Eichler neighborhoods to ensure that improvement projects do not diminish the architectural character. 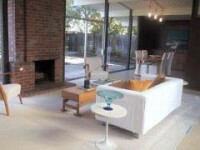 The Eichler Network web site is a great place to learn more about Eichlers. Incedentally, the Greenmeadows tract across East Charleston Road to the south was reported to be Joseph Eichler’s favorite among his dozens of area tracts. There is a central recreation and childcare facility, and the architecture represents a pinnacle in the translation of Bay Region and ranch house styles into a mass produced yet varied spec house design. Together, the two subdivisions are two of his best known. Posted in Surreal Suburbs and tagged with Eichler, Fairmeadows, Palo Alto. RSS 2.0 feed.